Maine is legendary cruising territory: rocky, craggy coastline, uncountable number of islands, lobsters aplenty, and larger than life personalities. Real people, real natural beauty, real fog. The itinerary we have here will take you in and around Penobscot Bay , Blue Hill Bay , and Mt. Desert . Between Rockland and Camden , for one week, you can leave the world of train schedules, gameboys, and telephones behind. It might well be a week spent "at sea" where weather, the next mark, filling your stomachs and a friendly game of poker are really the only things that matter. Life can almost stand still for one short week while you explore what has to be one of the most breathtaking cruising grounds imaginable. And if you get lucky and keep a good watch out, you may even see seals and whales, moose and bears. So start planning now. August is the best time to cruise in Maine . It's when the weather often provides a window in the fog and when the water is warming up (notice we didn't say it was warm). It is best, however, to ensure that you have systems by which to navigate in the fog and tricky weather (radar, GPS, etc) and that you know how to use them effectively. We've been to Maine when there was an entire week with no fog. Friends of ours spent an entire summer in Maine before departing for the Caribbean one year and had all of one day without fog. So you never know. Best to be prepared. Rockland as the starting point offers numerous boating facilities, an airport, rental cars, bus service, provisioning resources, and chartering possibilities. Rockland is a commercial hub that is undergoing a renaissance. It is also currently home to many museums, including the Farnsworth Art Museum which houses one of the finest and most complete collections of Maine art, especially that of Andrew, N. C., and Jamie Wyeth. Rockland is also a day's sail (about 65 nm) from Portland , ME and less than a day's sail from almost all other points along the cruising coast of Maine . 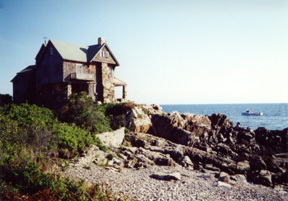 By car, Rockland is about 70 miles (1.5 hours) from Portland , ME. Portland has an excellent airport and Amtrak service from Boston 's North Station (not South Station) four times daily. To cruise in Maine , if you live elsewhere, you need to either get your boat from wherever it is now to where you want it in Maine , or you can charter. The Rhumb line distance from Western LIS to Rockland , ME is about 320 nautical miles, and as Western LIS is where we are, that's where we will begin our pre-cruise preparations to help you think through those types of options. Some additional items to consider when contemplating cruising in Maine is that the water is cold, even toward the end of summer, so swimming is only for those with strong hearts and brave souls. Also, facilities are not as sophisticated and provisioning in Maine is not as easy as in many other cruising territories on the east coast. You need to plan provisions adequately as many of the most scenic places do not have easy access to reprovisioning sources and major tidal variations can make getting things aboard challenging. Finding a shower and a head ashore is not always feasible, so you must have sufficient holding tank capacity for your crew in the time you are aboard, or a plan for accessing pump-out stations en route. If you are planning to leave your boat in Maine for a while either before or after your cruise, Rockland has enough moorings and slips to offer many long-term alternatives, but we recommend you start your planning and research early as the choice locations do get booked up. A great place to start your research is with The Maine Coast Guide. 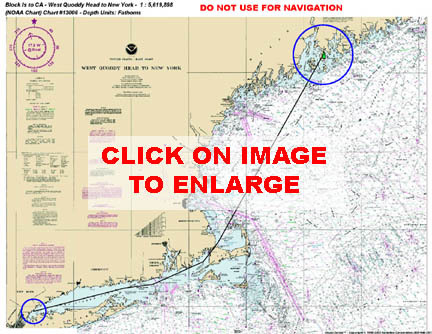 This website details every harbor and anchorage in Maine and is brought to you by the publishers of Maine 's definitive cruising references, A Cruising Guide to the Maine Coast and the Maine Coast Guides for Small Boats. It is complete with charts and almanac data and links to Maine 's marinas and boatyards, information on sea kayak outfitters and the Maine Island Trail, as well as boats for charter or sale.You can also find a wealth of information on the CruiseMaine website, the cruise ship industry's e-commerce site. So welcome aboard and let's dive right in to our planning. Click on the links below for more information.